Hello everyone!! It's Wednesday and that means it's time for the Color Throwdown Challenge. Vickie is this weeks hostess and she has picked a beautiful quilt for inspiration...love the colors on this!!! When I was cleaning my craft room, I found several diecuts that I had cutout for other projects and discarded for one reason or another....I'm on a recycle kick so I was bound and determined to make them work!! The colors are a little off but still in the same family so I guess that's ok....hope the challenge police don't come knocking on my door...LOL!!!! 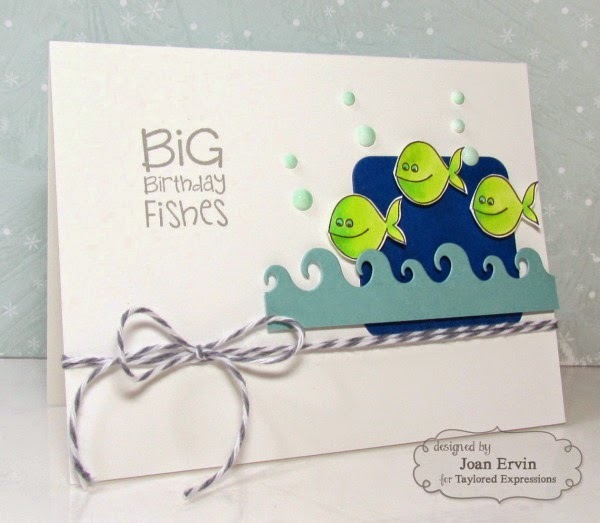 My card features the sweet little fish from the Under the Sea stamp set by Taylored Expressions. They were colored with Copics, cutout, and popped up on the TE Pockets and Pages Essentials 2x2 diecut with foam dots. The TE Wave Border die was used to cut the wave from Baja Breeze cardstock and the sentiment from the same set, enamel dots, and the twine finish it off. Remember, you don't have to use the exact colors.....use what you have as long as they are close to the challenge colors and be sure to add CTD309 to the keywords section when you upload your cards to an online gallery so we can find your creations!! Oh, this is a cutie Joan! Love those fishes and the wishie! Great colours! 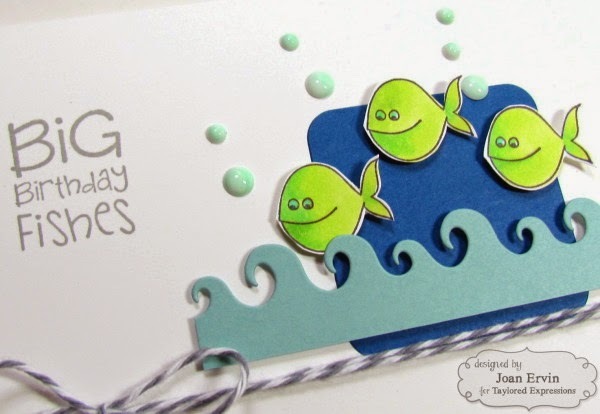 aww those little fish are so cute.. fun card. This totally makes me smile. Loooove the fishy and their bubbles. Looks great. Awww...this is just too adorable! Fintastic! ACK! Cuteness overload! Those fish are DARLING and your layout is seriously fintastic (see what I did there? LOL). LOLOL I'm stealing Jodi's line... this is FIN-tastic, Joan! LOVE those bright green radioactive fish! LMHO! This is so dang cute!! I love the layout and I love the enamel dots for bubbles! Awesome!